Another day, another new restaurant opening in Melbourne. Social media food storms leave hungry foodies battling for reservations or queuing for hours just to be the first at the scene for the latest hip thing. I prefer to bide my time and wait for the restaurant to settle in a bit, iron out its tiny flaws and see if it’s strong enough to weather the storm. Average restaurants come and go. Once the buzz wears off, line-ups inevitably decline and often dissipate to half crowded restaurants within months. Then there are the stayers who are in it for the long-term, sailing through a battlefield of fierce competition. One of these is likely to be Hardware Street’s latest late night bar/eatery – Nieuw Amsterdam. Nieuw Amsterdam brings a little slice of New York to Melbourne. If you venture past touristy Hardware Lane, away from the desperate pleas of waiters to lure you into their restaurants, and follow the windmills to hipper Hardware Street, you will find this New York inspired establishment. Upon entering you will be wowed by this sleek and sophisticated fit-out. It’s a beautiful space. Everything from the dark wooden paneling to the high ceilings and towering archways carved out of exposed brick ooze a certain sense of elegance. The new late night/bar eatery is owned by Michael Roszbach (ex Cookie) with Nick Stanton (ex Gordon Ramsay) taking the helm in the kitchen. Stanton’s passion for American food shines through in this fun, experimental menu. Starters like barbequed scallops, black kingfish ceviche and broccoli and cheese profiteroles tantalize the fussiest of taste buds. There are also modern takes on classics like grits, jerk chicken and clam chowder. 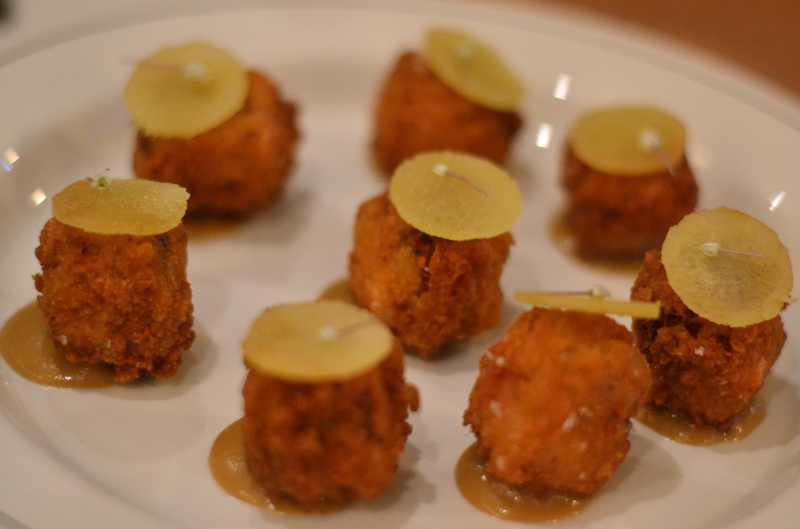 Delicious golden morsels of pork trotter and ham hock nuggets ($13) arrive, topped with paper-thin slithers of crisp apple and a small pond of burnt onion jam. The sweet and sour flavours meld together harmoniously, beautifully offset by the salty chunks of braised ham hock in the nuggets. The crumb had a wonderful texture, crisp with a beautiful crunch. 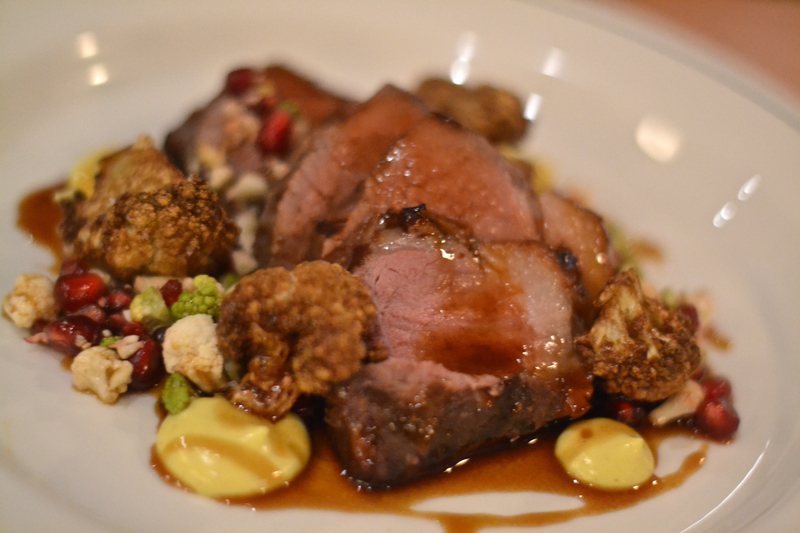 The spiced lamb leg ($20) was brilliantly executed – cooked to perfection with a rosy blush. Little buds of cauliflower accompanied the lamb, with a healthy dollop of cauliflower puree, which was surprisingly moreish. A final sprinkling of juicy pomegranate provided a juicy burst of flavour and colour to the dish. Melt in your mouth Southern style pork belly chops ($19.50) were tender and succulent. 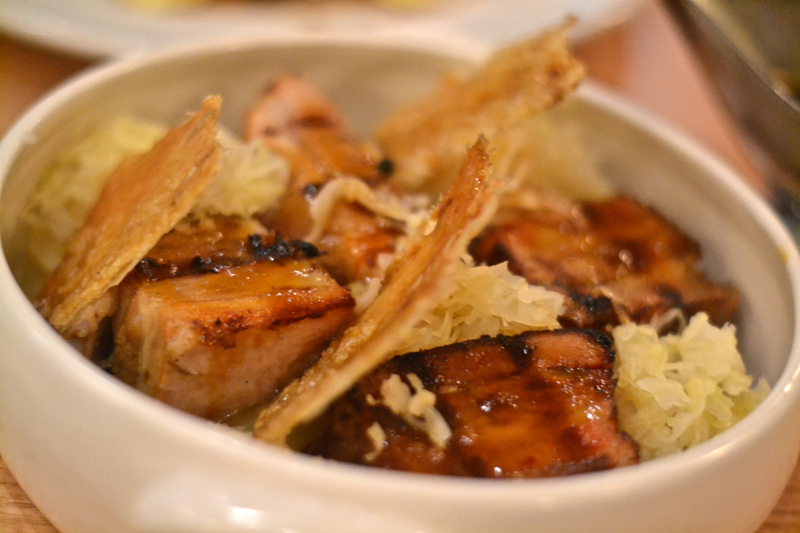 The bed of finely shredded sauerkraut was a perfect base to mop up the pork juices and hearty applesauce. Impossibly crisp pieces of pork crackle achieved that elusive crunch and provided the dish with a lovely textural element. All dishes are priced under $20, which for the quality is a steal. The service is welcoming and friendly although it is still evident they are still finding their feet. But with the quality of the food and warm atmosphere I didn’t mind just one bit. If you can manage, try to find your second stomach for dessert or be lured to the gorgeous bar downstairs to try their cocktails. I loved it so much I was back the week later. The storm surrounding Nieuw Amsterdam wont be disappearing anytime soon. Get in while you can. The Damage? Approximately $100 for 2 mains, starter, wine and service for 2 people. One of the best places in the CBD – I concur.